After hearing about the Portland International Film Festival (which ended 2/22/14), I decided to see a movie. I found the festival, the listed movies from Spain and Mexico, and read the descriptions for each of the movies. In my search for other events in Spanish, I learned of an upcoming movie playing about the Mexican sport/pastime of Lucha Libre or “free wrestling”. This movie sounded a lot more fun than the other dramatic Spanish language films being shown at the festival, so I decided to see it. “Lucha Libre” is part of a Mexican movie series called “Cinescopio” being shown at the Hollywood Theatre (http://hollywoodtheatre.org/cinescopio/) in Portland. When I found the event, I noticed it listed “Viva Lucha Libre” as a documentary, but on the evening of the event the page had been updated to describe a “double feature” with a science fiction flick as the opening film. I had left work late, returning home in Tigard at 6:15pm and the film started at 7:00pm in Hollywood. Since I’m not a fan of “sci fi” and the 5-North was heavily backed up, I called the theatre to find out when the first film ended and the documentary began. The guy who picked up the phone at the theatre sounded surprised. He asked me incredulously, “Are you trying to miss the first film?” I explained I didn’t know if I had enough time to make it there. Then he reluctantly gave me the info. However, when I told my husband the name of the first movie, “Santo Contra La Invasion de Los Maricanos” (Santo vs. the Martian Invasion), he said, “It’s Santo, Mexico’s most beloved wrestler!” Not knowing myself who Santo was, he insisted I had to see “Santo”. Despite stopping to pick up burgers at Burgerville, wolfing down dinner on the drive, getting stuck in heavy traffic on I-5 north, then taking a detour through downtown (thanks to my GPS) to catch the 84 freeway off the Morrison Bridge, and looking for a street parking space near the theatre just off Sandy Blvd. ; we made it. We bought our tickets, found seats inside the theatre and sat down just before the lights went down. We couldn’t have planned it any better. Going to see “Santo” for the first time was full of surprises. Firstly, I was surprised that the opening film was shot in 1966. For some reason, I was expecting a contemporary film, but instead was delighted by the vintage costumes, hairstyles, cars and technology. The slow, alien-related storyline reminded me of a “Twilight Zone” episode. The Martians’ shiny, caped costumes were so preposterous that the entire audience busted out with laughter when they first appeared. I had heard that “unmasking” a Mexican wrestler is the end of his career, so I should not have been surprised that Santo remains masked for every scene, except for a dream sequence when we are only shown the back of his head. Never seeing Santo’s face, as the main character in the film, was surreal. But, I eventually got used to it. While I had to resort to reading English subtitles for many scenes, I was able to understand quite a bit of the Spanish in the film. I even noticed when a translation was off once. It had been translated in favor of making the dialog sound kinder than it was. When a man was annoyingly telling his wife something, he used the word “mujer” which the translation incorrectly referred to as “dear”. Much to my surprise, the theatre was not simply an audience of passive spectators. The audience was extremely supportive of Santo (as if a live wrestling match were taking place). There were audience members in full masks, and during the fight scenes, many in the audience were hooting and cheering Santo on to victory or booing the bad guys whenever they got the best of Santo. The energy in the room was contagious; it made the event exciting. As it turned out, the main attraction was the first film (the very film I didn’t think I wanted to see). It explained the theatre worker’s incredulous tone over the phone. The room died down considerably after the first film. The documentary was disappointing. It was very short (about 30 minutes), and interviewed mostly American scholars or comedians instead of authentic people with closer ties to the actual “Lucha Libre” community. I was impressed to learn just how popular these Mexican wrestlers are. 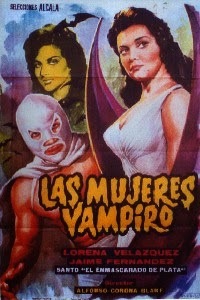 The documentary focused on “Santo”, “Blue Demon” and “Mil Mascara”. I never would have guessed just how many movies these wrestlers made. They described the wrestlers in these films as “James Bond” figures; they were looked up to, idolized, they saved the good guys, defeated the bad guys, and always got the girl. I never knew the Mexican wrestlers did anything but wrestle, so it was neat to see just how important their roles became, extending from the wrestling ring to immortal film icons. The Mexican wrestling films are truly an interesting blend of American and Mexican cultures. I never realized that the 1960’s American styles would appear similar in other countries. For instance, the hairstyles, cars, electronics and more depicted in the film were very clearly from the 1960’s era. It was curious to see this, because I expected Mexico would have depicted more of its own culture in its films. It made me wonder just how cultures become influenced by other cultures in some ways, but not in others. Seeing this film has made me curious to view other vintage movies filmed in Mexico. I believe the historic value and culturally blended inspiration of such films will be very interesting to witness. In fact, I plan to attend the last film of the “Cinescopio” series called “Santo and Blue Demon vs. The Monsters” (1969). It will be shown on March 20th at 7:00pm at the Hollywood Theatre. Hope to see you there!